Luna is a lively 1,5 year old German Boxer, weighing 28 kg. 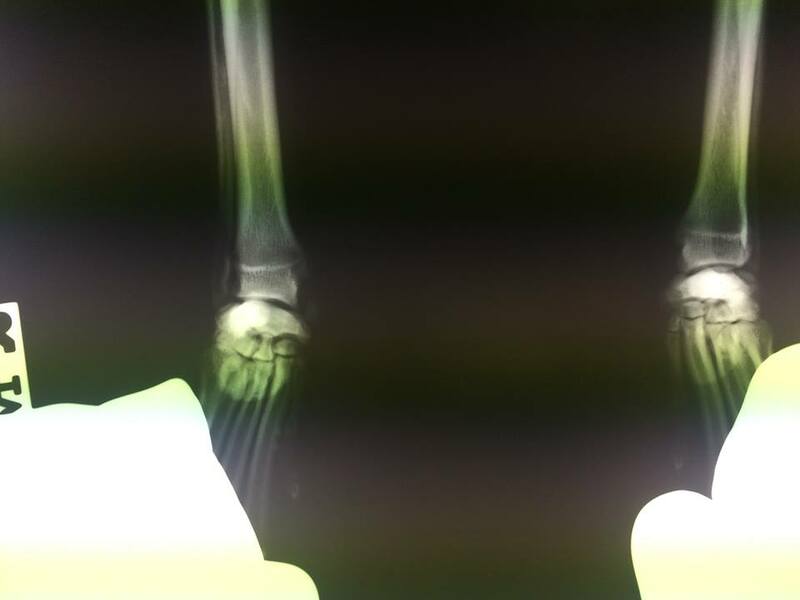 She was presented to us with chronic intermittent right front leg lameness of grade II lasting for almost a year. 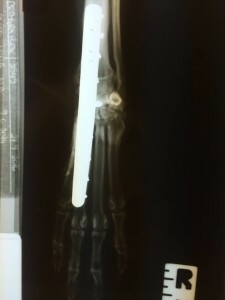 Her owners noticed a lump on her medial carpal site. The dog had a history of a car accident when she was only six months old. At that time Luna was treated conservatively with NSAIDs and rest. Luna became worse after time and she was reffered. Carpal joint is a hinge joint. 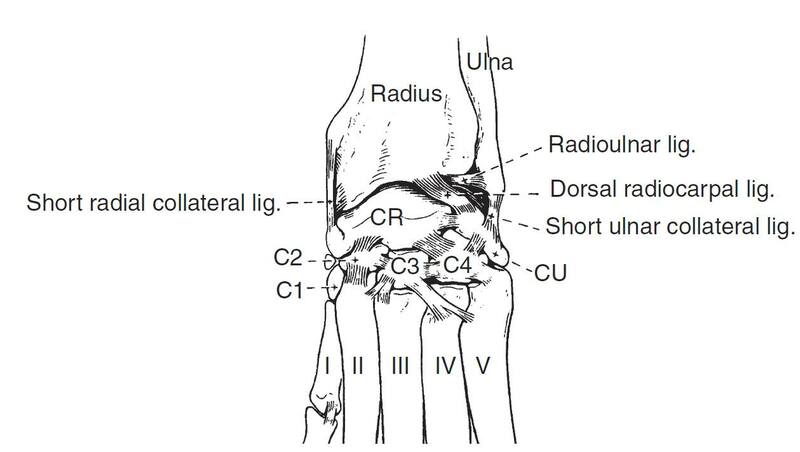 It is composed out of six carpal bones that are arranged in a proximal and distal row forming three levels of joint spaces; the antebrachiocarpal where most of the joint motion takes place, the middle and the carpometacarpal space. 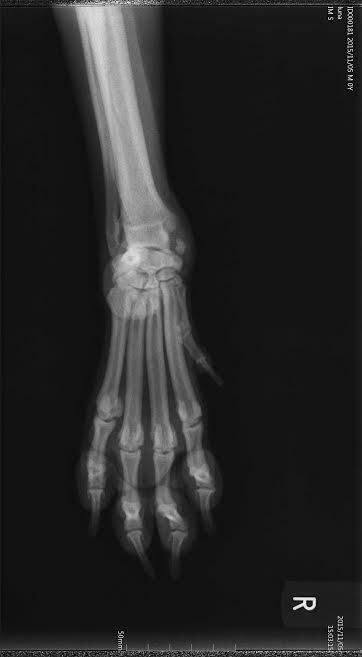 Luna was afebrile, lame on her right front limb, grade II. Her right front limb was shaking while standing and her carpal joint was slightly flexed. Right carpal joint was obviously swollen on the medial side. 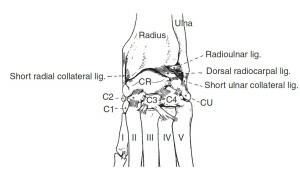 Carpal range of motion was mildly decreased in flexion, distinct pain was observed on flexion of the carpal joint and by pressing on the firm medial swelling. No apparent instability could be observed while doing clinical exam but only slight valgus. The rest of physical and neurologic exam was normal. We could also try to do a synthetic ligament reconstruction but since the problem was present for almost a year, the instability was present in multiple medial carpal levels and the dog did not improve, arthordesis seemed like a prudent decision. Luna did have some problems with compensation for the first two weeks after the splint was removed, but than started to improve consistently. Follow up xrays at 4 and 8 weeks were unremarkable. Luna is a very active young German Boxer who was intermittently but progressively lame for the last year. 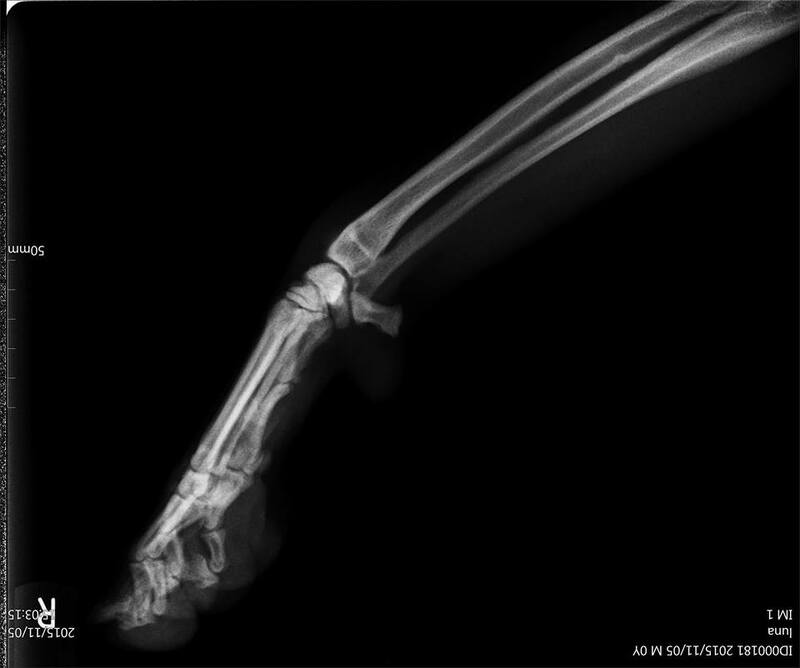 A chance to reconstruct the torn medial ligaments of carpal joint was probably unknowingly lost when the instability was missed at the first veterinary visit almost a year ago. Chronic instability is seldom succesfully solved by synthetic reconstruction which purpose is to achieve good and functionally strong stability. 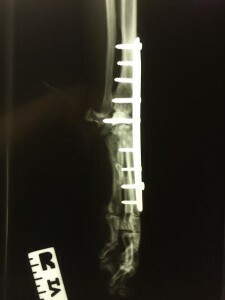 Unsatisfactory surgical stability again leads to pain and degenerative joint disease. Dispite apparent instability prooved on xrays, we were not sure how much it contributed to a development of chronic tenosynoviitis but we presume that the proximity of two structures resulted in abductor pollicis longus tendinopathy as well or differentially looking could also be a sign of an old avulsion fracture. 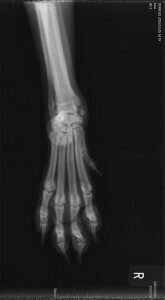 2 Pancarpal arthordesis in a dog: a review of forty-five cases, Robert B. Parker, DVM, S. Gary Brown, DVM and Alida P. Wind, DVM in American Collegue Of Veterinary Surgery. 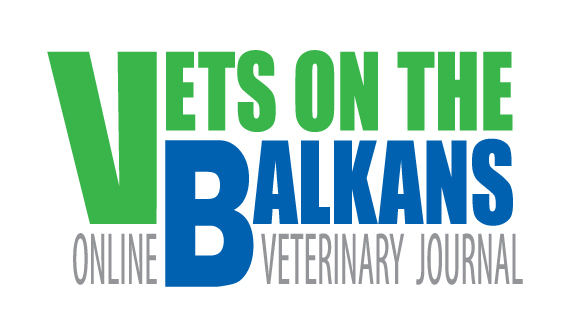 Previous Article← Green coat, hypothyroidism,lymphoma and carcinoma of the sebaceous glands.